Claus Fleischer is the general manager or CEO of Bosch e-bike systems. We caught up with him at Bosch’s Stuttgart headquarters, which is located in the heart of Germany’s transport industry development and production hub and is also home to the likes of Porsche, Mercedes and a large quantity of automotive product suppliers. Our aim was to ask him about how Bosch e-bike motors came to pass and also try and discover a bit about the mentality of arguably one of the most important transport system suppliers in the world and what they are doing for the cycling world. EBA: How did you become the boss of Bosch E-bikes? Claus Fleischer: I’ve been with Bosch more than 22 years, 15 years automotive, two years at the corporate headquarters as assistant to our CEO of Bosch, and I ride also in my leisure time—road biking, mountain biking, etc. In 2011 when we went to Eurobike to see what the e-bike team was doing. I was the assistant to the CEO, and we wanted to know what this e-bike product was all about. We knew we had this small startup and we were going to market, but we didn’t know details of what they are doing. I said, the best way to find out is if I made the trip to the bike show and give the CEO a full report. Previously, I had always gone to Eurobike as a customer, and now this was a business trip. This is how I started to get involved, then I found out a year later that my predecessor was going into retirement and they were looking for a successor. I raised my hand, and I said, “I know someone, that would be me.” I have a background in system engineering and business and cycling. EBA: What do you ride in everyday life? CF: Road, all-mountain, e-mountain bikes and at the weekend it’s a difficult decision which bike to take out for a ride. More often now it’s the e-mountain bike. EBA: You understand the different aspects of bicycling? CF: I would say so, and this is one of the assets I brought to the team. I did some mountain bike racing and touring when I was younger and even built my own bikes. One of my best friends owns a bike shop, and we would use his workshop on our own bikes. Having an understanding of the bicycle industry is totally different to the automotive or motorbike industry. EBA: As an e-mountain biker, how do you mix a huge corporate company attitude, straight and narrow, not quite suits but almost. How do you mix that with mountain biking? It’s a tough market to convince. CF: The answer is simple, but the execution is the challenge. If we want to enter a new market with a new product where we have never been before, then we have to separate this business from our corporate business and create a startup. You try to build something like a typical garage company. CF: Yes, of course, the initial team was two engineers, and they sat down and thought what they could do with Bosch technology, like lithium-ion batteries that we had just come out with and then electrical drives, which we have all over the car. They both came separately to the same idea that this could be something Bosch could have a system for. Then they pitched the idea to get some budget and resources to build a prototype. EBA: How much do you go and ask for? CF: We don’t want to disclose numbers, but initially it was a small $25,000 euro budget and using what we could get. Once they had a ridable prototype, the next question was if there was a business for it. A company like Bosch will always ask for the business potential behind any new product. Bosch typically does a very detailed strategic development process that starts with a market analysis: Is there a market? What is the market? What are the market segments? What are the price points? What type of structure do you need in your research and development, support, etc. Then at the end is there a payback for the investment? Then you invest in sales, service, manufacturing and everything behind, including engineers. Bosch is always working on innovation, like developing an anti-lock braking system for bicycles. EBA: Is there a return on investment? CF: There has to be one, and yes there is one now. EBA: That’s quite a short time frame to have a return on. Is that really a good business? CF: There are a few steps we have to look at like: Are you profitable in a given year forgetting about losses of the past? Can you break even? Have you accumulated a point of break even from all that happened before? EBA: That’s a very corporate way of looking at it, but mountain biking is all about “let’s just ride up the mountain,” and big companies can be seen as not listening to their end consumer. CF: That will never change. This is a perception, and once you are corporate and have a certain market share, you typically address the core of the market. You try to identify where you can be profitable, and for that you need a certain volume. If you attack only niche segments with no volume, it will be a challenge for that company. EBA: So a company like Bosch has some very influential political power in an economy. How much lobbying behind the bicycle world does Bosch do? Do you meet with politicians and show them what an e-bike is all about? CF: Absolutely, we do two things. When we came to Eurobike, many manufacturers, dealers and other people were afraid. Now these automakers are coming and it will be slow and expensive. We had to turn this image around. We made clear we are a reliable partner, and if we promise, we deliver. In this segment we have innovative power, and our engineers know what they are doing. We have already the structure from an automotive perspective our lobby processes in place, and we know how to do it and to get people onside. The person who started this part of the business still helps us on this. He has the right experience, right age and work experience to talk to a politician and be taken seriously when he goes to Berlin. We get involved in the right bicycle manufacturing associations, we help and support the bicycle industry, lobby strategy, key messages to politicians and also helping wherever we can. When we meet at a high level with governments, they know we do cars, motorbikes and now the bicycle. Test slave bike fitted with the Bosch Integrated battery. Notice the slimmer profile. Bosch’s new ABS is coming together. EBA: So how important has the bicycle become in the world of transport policy in governments? CF: At the end of the 19th century the bicycle was the most important mode of transportation in Europe to bring people from the countryside to the city to work in factories. They were more affordable than horses. Europe then had hundreds of bicycle manufacturers, because in every small town you had someone who could make a frame, a wheel or assemble a bike. Then came the invention of the car, so with motorbikes and cars, it was then cooler to twist your throttle than push a pedal and ride a bike. Now 100 years later we have traffic jams, congestion and emissions. Now there is a renaissance of the bicycle, which is being driven particularly by e-bikes currently, and people see it as active, and the bike system takes away the hard part. For some countries, though, cars are a status symbol; if you cycle, for example, in China, you are seen as poor. Different places need the time to discover that traffic congestion with cars is not really the right way to go, then they will be back to cycling again. EBA: How long before e-bikes are as cheap as a bicycle or cheaper than a second-hand scooter? Will they become ubiquitous? CF: I would say as long as the bicycle industry is a little bit like fashion and there is a fashion hype every year, and the industry invests in something new, this is very costly. Product life cycles need to become much longer, and that means that adding a battery and motor to a bicycle will always be more expensive. If you take high-production volume and reduce the speed of innovation, then you have more economy of scale so numbers will go up and prices less. 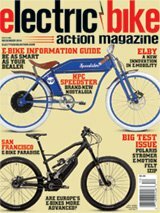 EBA: Do you think electric mountain bikes will take over? CF: It won’t take over fully, but they will take over a portion—a very important portion—of the ability we discovered over time of the enjoyment of riding uphill and over time we improved how our systems provide the power with the introduction of the CX motors. We enjoy what we do, and by bringing new products to the market, we hope people enjoy it as well. My job is to bridge the business and sport side of bike business for Bosch. EBA: What do you think of market competition? CF: It’s good. Our founder at Bosch once said that the worst thing that can happen to a business is not have any competition, because people would not feel the need to innovate and develop. It keeps everyone dynamic, and customers want to have a choice. We want to be the market leader and enjoy competition.